This living room is absolutely stunning! The restrained monochromatic color scheme and great mix of eclectic pieces exude style, sophistication and understated elegance. Incorporating a contemporary gray velvet sofa and the Louis XVI style armchairs in the same room is a fresh, unexpected touch. The contrasting furniture styles between the two different seating provide an interesting dynamic especially with the clean, modern lines against the curvy, classic silhouettes. A group of gorgeous blue and white ginger jar and vase collection provide a pop of color and visual delight. Layering a zebra rug on top of a pale, neutral rug creates another visual interest. I also like the elaborate yet unfinished look of the beautiful fireplace. 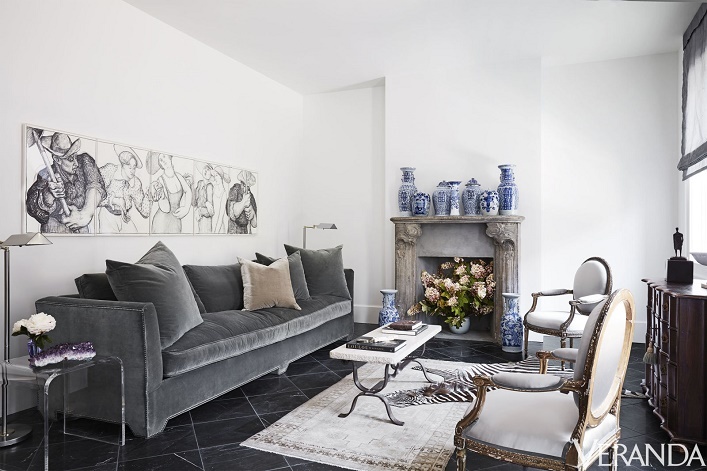 This effortlessly chic, calming and refreshing space is truly unique and inspirational, what's not to love? Your thoughts? Interesting room. Filled with tons of ideas! Cool designer alert- Natalie Chong! A fresh and chic Tribeca apartment! Which wooden floor should I choose? Why customization of sofas is worth it! A bright and beautiful Nantucket cottage!